Internal Factor Evaluation (IFE) matrix is a strategic management tool for auditing or evaluating major strengths and weaknesses in functional areas of a business. IFE matrix also provides a basis for identifying and evaluating relationships among those areas. The Internal Factor Evaluation matrix or short IFE matrix is used in strategy formulation. The IFE Matrix together with the EFE matrix is a strategy-formulation tool that can be utilized to evaluate how a company is performing in regards to identified internal strengths and weaknesses of a company. The IFE matrix method conceptually relates to the Balanced Scorecard method in some aspects. How can I create the IFE matrix? Conduct internal audit and identify both strengths and weaknesses in all your business areas. It is suggested you identify 10 to 20 internal factors, but the more you can provide for the IFE matrix, the better. The number of factors has no effect on the range of total weighted scores (discussed below) because the weights always sum to 1.0, but it helps to diminish estimate errors resulting from subjective ratings. First, list strengths and then weaknesses. It is wise to be as specific and objective as possible. You can for example use percentages, ratios, and comparative numbers. Having identified strengths and weaknesses, the core of the IFE matrix, assign a weight that ranges from 0.00 to 1.00 to each factor. The weight assigned to a given factor indicates the relative importance of the factor. Zero means not important. One indicates very important. If you work with more than 10 factors in your IFE matrix, it can be easier to assign weights using the 0 to 100 scale instead of 0.00 to 1.00. Regardless of whether a key factor is an internal strength or weakness, factors with the greatest importance in your organizational performance should be assigned the highest weights. After you assign weight to individual factors, make sure the sum of all weights equals 1.00 (or 100 if using the 0 to 100 scale weights). The weight assigned to a given factor indicates the relative importance of the factor to being successful in the firm's industry. Weights are industry based. Assign a 1 to X rating to each factor. Your rating scale can be per your preference. Practitioners usually use rating on the scale from 1 to 4. Rating captures whether the factor represents a major weakness (rating = 1), a minor weakness (rating = 2), a minor strength (rating = 3), or a major strength (rating = 4). If you use the rating scale 1 to 4, then strengths must receive a 4 or 3 rating and weaknesses must receive a 1 or 2 rating. Note, the weights determined in the previous step are industry based. Ratings are company based. Now we can get to the IFE matrix math. Multiply each factor's weight by its rating. This will give you a weighted score for each factor. 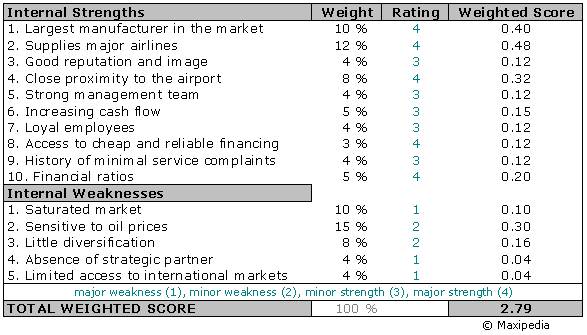 The last step in constructing the IFE matrix is to sum the weighted scores for each factor. This provides the total weighted score for your business. The following table provides an example of an IFE matrix. Weights times ratings equal weighted score. What values does the IFE matrix take? Regardless of how many factors are included in an IFE Matrix, the total weighted score can range from a low of 1.0 to a high of 4.0 (assuming you used the 1 to 4 rating scale). The average score you can possibly get is 2.5. Why is the average 2.5 and not 2.0? Let's explain using an example. You have 4 factors, each has weight 0.25. Factors have the following rating: 1, 4, 1, 4. This will result in individual weighted scores 0.25, 1, 0.25, and 1 for factors 1 through 4. If you add them up, you will get total IFE matrix weighted score 2.5 which is also the average in this case. Total weighted scores well below 2.5 point to internally weak business. Scores significantly above 2.5 indicate a strong internal position. What if a key internal factor is both a strength and a weakness in IFE matrix? When a key internal factor is both a strength and a weakness, then include the factor twice in the IFE Matrix. The same factor is treated as two independent factors in this case. Assign weight and also rating to both factors. What are the benefits of the IFE matrix? To explain the benefits, we have to start with talking about one disadvantage. IFE matrix or method is very much subjective; after all other methods such as the TOWS or SWOT matrix are subjective as well. IFE is trying to ease some of the subjectivity by introducing numbers into the concept. Intuitive judgments are required in populating the IFE matrix with factors. But, having to assign weights and ratings to individual factors brings a bit of empirical nature into the model. How does the IFE matrix differ from the SWOT matrix method? One difference is already obvious. It is the weights and ratings. This difference leads to another one. While it is suggested that the SWOT matrix is populated with only a handful of factors, the opposite is the case with the IFE matrix. Populating each quadrant of the SWOT matrix with a large number of factors can lead to the point where we are over-analyzing the object of our analysis. This does not happen with IFE matrix. Including many factors into the IFE matrix leads to each factor having only a small weight. Therefore, if we are subjective and assign unrealistic rating to some factor, it will not matter very much because that particular factor has only a small weight (=small importance) in the whole matrix. It is important to note that a thorough understanding of individual factors included in the IFE matrix is still more important than the actual numbers. Are there other models I should know about? The IFE matrix goes side by side with so-called EFE matrix which together lead into the IE matrix. You might like to read about the SWOT matrix analysis, BCG matrix model, and Product Life Cycle.